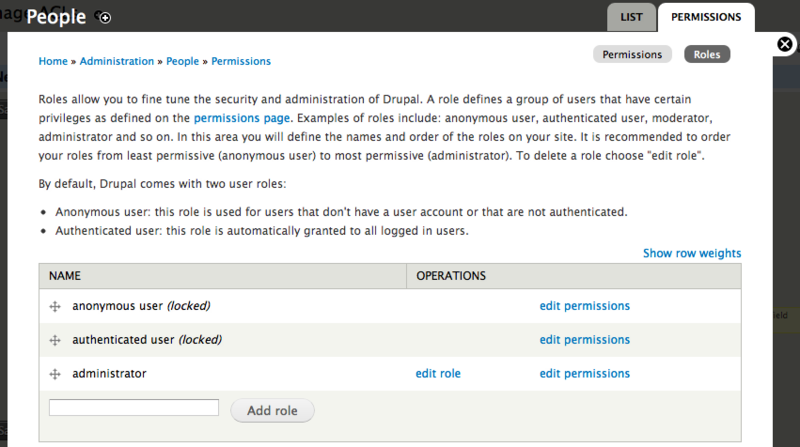 To access Drupal's permissions, go to the Drupal menu, choose the option People and click the Permissions tab in the top right corner of the pop-up window. Here you will find a long list of all possible operations/actions a user could perform in jManage (CiviCRM) and Drupal, with columns for each existing role type. Checking an option in one of the columns will grant that role the ability to perform the action. You may create new roles and edit all existing ones. To edit roles, while in the Permissions tab click the button Roles toward the top right of the page. Open a user's contact record (a contact in jManage with a user account), hit the Actions button at the top and select User Record from the menu. When the next screen appears, click the Edit tab (top right) and then scroll down to the section titled Roles; here you may change their level of access. As an administrator, go to the Drupal menu and select the option People. When the list of active users appears, click on the desired name to open their Drupal user profile, go to the Edit tab at the top-right of the page, and then scroll down to the Roles section.